Jim Bryson & the Weakerthans band in Montreal or Quebec City? Inform me about the next events for Jim Bryson & the Weakerthans band. 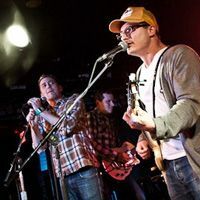 Enroll yourself to our priority waiting list for Jim Bryson & the Weakerthans band to be alerted when new tickets are available. Filling this form doesn't engage you to any purchase. Jim Bryson & the Weakerthans band will be performing at Cabaret Mile-End, in Montreal, on February 10th, 2011.